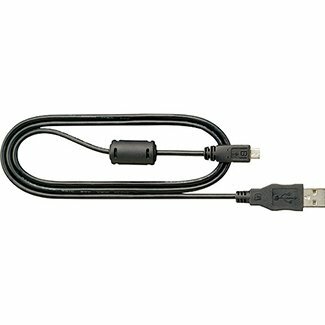 The black UC-E21 USB Cable from Nikon connects a compatible digital camera to a computer or a charger. It features a full-size type-A USB connector on one end, and a micro type-B on the other. The cable is included with the EH-71P Charging AC Adapter, which is supplied with the COOLPIX S5300 and S6800 cameras, and is offered here as a spare or replacement part.